Consider the three data sets below. The first data set is an example of an ungrouped data set while sets 2 and 3 are grouped data sets. 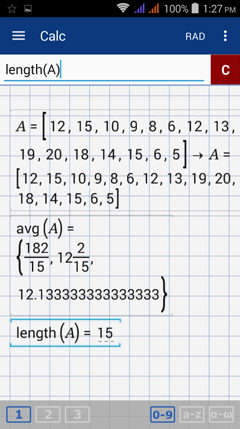 To find the mean of Data Set 1, add 4 + 5 + 6 + 8 + 9 + 10 and divide by 6 (since there are 6 data points). The sum is 42/6 = 7. To find the mean using the calculator, type avg (4, 5, 6, 8, 9, 10) or mean(4, 5, 6, 8, 9, 10). The calculator displays 7 using both methods. 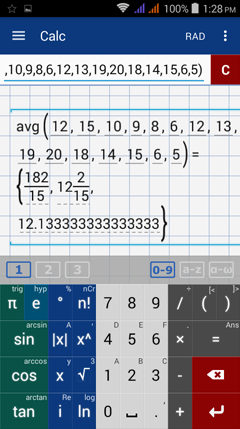 You can also use the avg function found under the factorial key (n!). Enter the data set in parentheses and separate data points using a comma. 1) The test scores (out of 20 points) of 15 students in a Statistics class are: 12, 15, 10, 9, 8, 6, 12, 13, 19, 20, 18, 14, 15, 6, 5. What is the average test score? 2) The starting monthly salaries of 10 employees at a certain company are listed below. What is the average starting salary of these employees? 1) Hold the factorial key (n!) 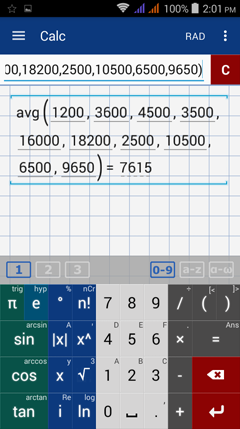 and select avg​ or type "avg" using the a-z keyboard. Note: if you want to use the same data set again, you can enter it in matrix form using brackets and assign it a name. For example, if you want to fight the length or number of observations, you can name the data set as matrix A. To find the mean, use the command "avg (A)." To find the length, use "length (A)." Hold the factorial key (n!) 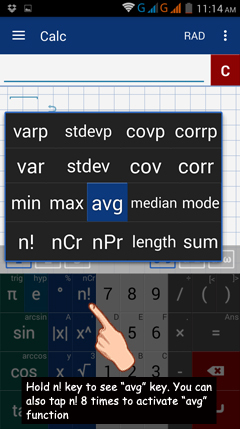 and select avg​ or type "avg" using the a-z keyboard.